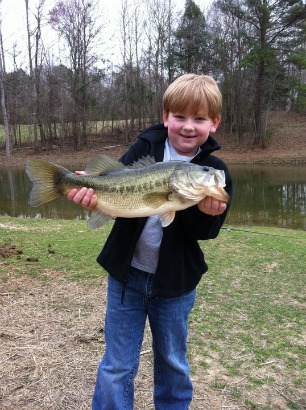 The opportunities for great Alabama bass fishing are abundant, especially in north Alabama. Round up your fishing buddies, call your favorite Alabama bass fishing guide and get after it man! The Tennessee River forms several outstanding bass fishing lakes in Alabama. Let's talk about these lakes. Lake Guntersville is located on the Tennessee River, 11 miles northeast of Guntersville, Alabama. Its shoreline measures 949 miles and the lake is spread over almost 68,000 acres. National and local bass tournaments are held here on a regular basis. Cabin rentals, camping and marinas are available around the lake. One option is nearby Lake Guntersville State Park. This park offers more than just camping areas and cabin rentals. This park is one of five state park resorts in Alabama. Taking relaxation to a new level is the objective here. Take in this experience after a long day on the water by visiting Lake Guntersville State Park. Wheeler Lake is the second largest lake on the Tennessee River in Northern Alabama. It is bordered by Guntersville Lake and Wilson Lake. Great largemouth bass fishing can be enjoyed if you have the right fishing guide. Camping, cabin rentals, boat rentals and marinas are available around the lake. Joe Wheeler State Park is located on the north side of the lake off U.S. Highway 72. This park is also one of the state park resorts. Make your reservations early for a great fishing trip at Joe Wheeler State Park. 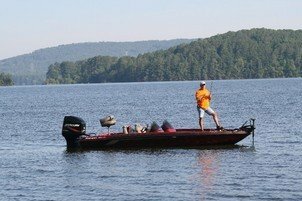 Wilson Lake is another lake on the Tennessee River that is fertile for bass fishing. Largemouth bass up to 9 pounds are caught here regularly. This lake is almost 16,000 acres and has the beauty of natural wildlife refuges bordering its shores. The cities of Florence and Muscle Shoals are located on the west end of the lake. Joseph Wheeler State park is near the east end and they all provide lodging and other services. Pickwick Lake is the northern most bass fishing lake on the Tennessee River in Alabama. It begins at Wilson Dam in Alabama and extends to the extreme northwest corner of the state, borders Mississippi for ten miles, then runs up into Tennessee to the Pickwick Dam. Pickwick Lake covers 47,500 acres and is 53 miles long. The middle to lower reaches of Pickwick Lake provide excellent habitat for largemouth bass. The nearby cities Florence and Muscle Shoals provide marinas, lodging and something to eat for hungry bass fishermen who have been pulling in big bass all day and night. 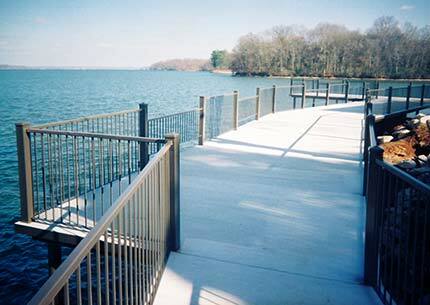 Handicap Fishing pier at Wilson Dam. Take advantage of the wealth of knowledge these Alabama bass fishing guides have to offer. Charter a bass fishing trip soon before the spring spawn begins. Those big ole female hawgs will be waiting to see just how good you are at pulling them off their beds!